The 2nd presentation of “The Excellence of Fur” took place in Thessaloniki, among eager young designers who wished to learn more about fur and the Greek Young Designers’ Competition that has been launched by Hellenic Association of Furriers. 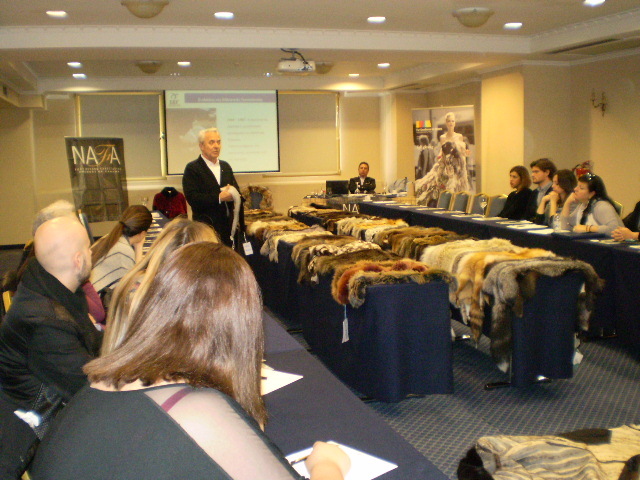 NAFA, one of the largest fur auction houses of the world, which sponsors this Competition, gave the opportunity to attendees to hear through its vice president, Mr Bob Poulios, about the importance of quality of fur skins, the rules & regulations that are strictly applied on fur breeding farms for the wellbeing of animals, and the sustainability characteristic of fur. NAFA’s latest campaigns and special events organized in some of the largest cities of the world were also presented. HAF’s representative Mrs Aphrodite Zourla, informed the attendees about the fur industry and its close relationship to fashion and design, pointing out their opportunity to introduce themselves into a dynamic, extrovert industry. All of the participants had the chance to look and touch the different kind of fur skins that are used for the making of a fur garment. The various techniques which have been developed by NAFA’s Studio were presented by professor at the Royal College of Art – London, Basil Kardasis, who urged them to activate their fantasy and freely create their proposals that they can submit to the competition until December 2nd, 2015. Fair News,Workshop "Discovering Fur Excellence"